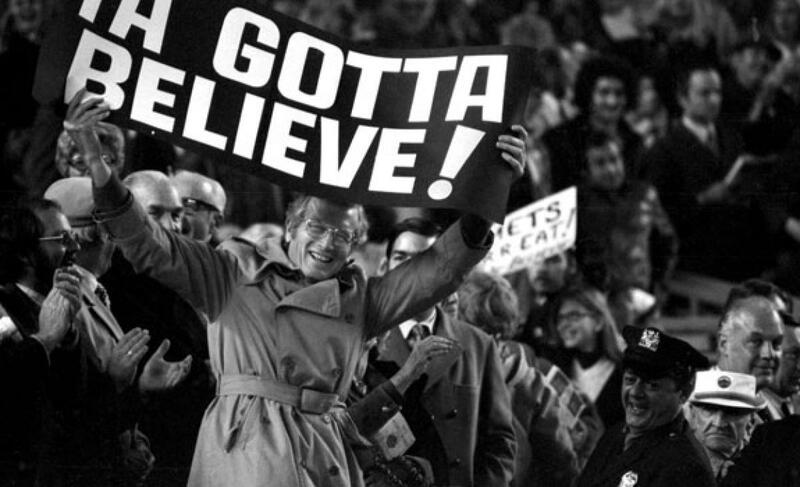 We Gotta Believe! | A blog for Mets fans, enthusiasts, and cynics alike. Ya Gotta Believe! The Mets have won two in a row after a four game losing streak had them losing two of three to the Phillies and Marlins. After a 2-1 win on Wednesday, largely fueled by strong pitching performances, the Mets broke out offensively with a 6-5 victory last night. While they did hit 4 home runs (by Conforto, De Aza, Cespedes, and a right-handed Walker), they were 0/10 with runners in scoring position. Not helping matters, the Mets had two baserunners thrown out at the plate with no one out. While the lack of production with RISP is a bit concerning, it should come with the increased offense (14 hits last night). Alejandro De Aza had a fantastic game last night, falling just a triple shy of the cycle (Cespedes did the same). He got thrown out trying to score from first on a Granderson single, but he capped it off his night with a diving catch in left. He may have played himself into today’s game. I imagine Collins may wish to give Granderson a day off, allowing De Aza the opportunity to start in right and Lagares in center. Finally, much attention has been paid to Terry Collins’ decision making of late, especially using Jim Henderson in Wednesday’s 2-1 victory after he had thrown a career high 34 pitches the night before. Using Familia for a third straight game to get a 5-out save was also widely criticized. Personally, I’m not a huge fan of Collins’ explanations of his decisions, but he often does make the right decision. Jim Henderson was obviously a bad call, but had Addison Reed come in and blown the game, we’d all be asking why Familia wasn’t in for the extended save. An interesting quote from last night suggested that Collins started De Aza because he has good numbers in Cleveland’s ballpark. Terrible reason to start a player, but right player to start nonetheless. It’ll be interesting to see how Collins’ decision-making and explanations progress going forward this season. I think we all had a bad feeling about this one. There are some bright sides though. Against my more instinctual pessimism, let’s give optimism a try. Jerry Blevins looked good! And, um, Harvey was solid! Conforto was 2/2 with a double and 2 walks! Bartolo Colon entered the game and struck out a guy! Unfortunately, the negatives reigned this game. Matt Harvey, though looking very strong at times, was unfortunately more human than the Mets were able to afford. He allowed 8 hits and 4 runs (3 earned) over 5 2/3 innings, striking out 2 and walking 2. Yoenis Cespedes dropped an easy line-drive in left field, helping lead to the first Royals run. By the 6th inning, the Mets were down 4-0, unable to muster anything against an effective but slightly-wild Edinson Volquez. David Wright looked slow, and came up just shy on a couple of charging plays in the field. In the 9th inning, with the tying run on 3rd base and 1 out, Wright was blown away by sheer velocity from Wade Davis, as he was unable to lift a fly ball to get Alejandro De Aza in from 3rd. The Mets also left a bunch of runners on – 9 for the team (4 for Asdrubal Cabrera and David Wright, 3 for Travis d’Arnaud). They were 1/10 with runners in scoring position. Juan Lagares missed a shoestring catch at one point, but did make a fantastic throw to try to get Omar Infante at 3rd base (the call stood on replay review – and honestly, it was extraordinarily too close to call). But the rallying in the 8th and 9th was certainly a positive sign, even if it came up just short. Replay this game in May or June of last season, and the Mets lose 4-0 as Volquez no-hits them while walking 6. In the 8th, a single by Juan Lagares and walks by Curtis Grandereson and Yoenis Cespedes loaded the bases with 1 out for Lucas Duda, who was the tying run at the plate. Duda jammed a ball to left field, scoring 2, and Neil Walker brought in a 3rd run on a fielder’s choice grounder. Michael Conforto singled, but Luke Hochevar came in and got Asdrubal Cabrera to strike out with 2 on. In the 9th, Travis d’Arnaud walked and pinch hitter Alejandro De Aza grounded into a force out. Curtis Granderson singled to center, and De Aza aggressively took 3rd place and slid in safely on a close play. But, Wade Davis struck out David Wright easily, and after a little bit of work struck out Yoenis Cespedes as well. Say what you will about last night’s game and the Mets’ offensive ineptitude, but it certainly looks like they have the offensive ability not to let any game get away from them. The Mets play the Royals again tomorrow, after an excruciating off day, with Noah Syndergaard opposing former Met Chris Young. With arbitration decisions upcoming, here is a preview of the arbitration eligible Mets. As a reminder, players are eligible for arbitration if they have more than 3, but less than 6 years of major league service time. Players with more than 2 but less than 3 years of service time are also eligible, provided they are in the top 22% in major league service time for that particular class of players. If a player enters an offseason with more than 6 years of service time and has not already signed a multi-year extension, that payer is eligible to become a free agent (as is the case with Daniel Murphy). If the team and the player cannot agree on a salary, their case is sent to a neutral arbitrator who will decide which of the two cost figures is more reasonable. The team maintains control over all of these players for at least the next full season. In terms of costs, payers are due raises through arbitration. They cannot be offered less than 80% of their previous season’s salary. Therefore, underperforming and injured players are at significant risk of being non-tendered. Service time is listed as years.days. Therefore, 3.072 means 3 years, 72 days of service time. 172 days equals a year of service time, despite the fact that a season is usually 182-184 days. Often, teams exploit this to gain an extra year of control over a player (as the Cubs did with Kris Bryant this season, and the Mets did with Ruben Tejada a couple years ago. Notice that Tejada sits at 4.171, or one day short of 5 years). I will also list the projected free agency date (2018 means after the 2018 season), as well as the projected salary, according to MLB Trade Rumors (assuming the player is tendered a contract). Also of note, Juan Lagares signed a 5 year extension before last season. Therefore, his arbitration years have been bought out and he is not eligible for arbitration. The Mets will not let any of these players go, and will probably try to extend at least a couple of them (Duda seems the most likely extension candidate, despite the fact that he rejected a 3/$30MM offer last offseason). Harvey, represented by Scott Boras, seems least likely to sell out his free agency years, but may be open to a 2-3 year extension to buy out multiple arbitration years. This consists of two categories of players: useful but expensive (Reed, Tejada) and cheap but risky (Torres, Edgin). Reed is the most likely in this group to be tendered a contract after his strong bullpen work after he was acquired from the Diamondbacks. However, he entered his arbitration years as a closer, and therefore is owed considerably more money than relieveres of his type. If the Mets lack the finances to pay him, he will be non-tendered. Tejada is another one that is useful, but it is looking more likely that the Mets will non-tender him and promote Matt Reynolds as the backup middle infielder. $2.5 million is a bit expensive, but options on the free agent market would be similarly priced. It really would be a shame if Tejada’s Mets career ended on a takeout slide by Chase Utley. Torres struggled last year, but his stamina and versatility could keep him as an attractive bullpen option. If the Mets non-tender him, it will be because they are more comfortable filling the bullpen from within the organization, or from low risk free agents. As was the case with Tejada, $800K seems like market-rate for a player of Torres’s ilk. Josh Edgin, on the other hand, is a lot riskier to keep. Recovering from Tommy John surgery, Edgin would not be ready to return until midseason. That being said, $600K is not a lot to pay for a wild card. Though rumors have popped up suggesting the Mets could retain Mejia, I simply can’t see it happening. He would not be eligible to return from his 2nd suspension until late July. If I am correct, I believe that would only put the Mets on the line for $1MM of Mejia’s projected $2.6MM salary. Unfortunately, Mejia has destroyed his reputation and standing in the clubhouse. $1 million for 2 months of Mejia simply may not be worth it, especially when it comes with other baggage. Can you imagine the PR nightmare if Ruben Tejada, postseason rallying cry, is non-tendered for financial reasons but Mejia is retained? Time for the Mets to cut their losses. 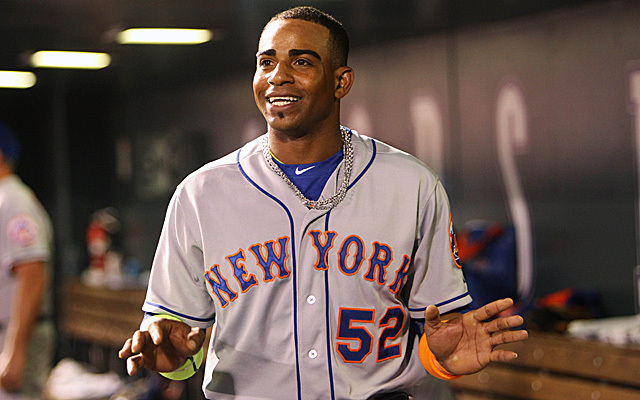 Yoenis Cespedes won the 2015 gold glove for American League left fielders. Curtis Granderson fell to Jayson Heyward for the NL right field award, and Terry Collins is a finalist for NL Manager of the Year, alongside Mike Matheny of the Cardinals and Joe Maddon of the Cubs. For more up-to-date news and notes as they happen, be sure to follow me on Flipboard!